“Despite getting back together, Rob and Kristen will have separate hotel rooms booked for them on the upcoming promotional tour for Breaking Dawn-Part 2. Summit Entertainment isn’t taking any chances that the couple will have problems again and be forced to scramble at the last minute to book one of them a posh hotel suite,” a source close to the situation tells Radar. “In fact, in several cities, rooms have been booked for Kristen at a separate hotel from the rest of the A-list cast. Rob and Kristen are always professional, but the fact is she cheated on him, and this media tour needs to go off without a hitch. Summit wants the final installment of the Twilight franchise to go off without a hitch, in order to prime the movie to break box office records,” the insider adds. “Rob and Kristen are legally required to promote Breaking Dawn-Part 2 together along with the rest of the cast. Their individual contracts have very specific language about what is legally required of Rob and Kristen to do on the publicity tour. The studio execs at Summit weren’t happy when Rob and Kristen broke up, but this is why there are clauses about what is required of the stars to do. The promotional tours of the past Twilight movies are very much anticipated by the fans and almost becomes bigger than the movie,” an insider previously told us. So basically, Rob and Kristen are contractually obligated to stick together, but have to sleep in separate hotels because they can barely stand one another? Holy crap, it’s like they’re your parents waiting for you to go off to college before they divorce. Still a better love story than Twilight though. RuPaul's Drag Race Week: Top Five Contestant Singles! 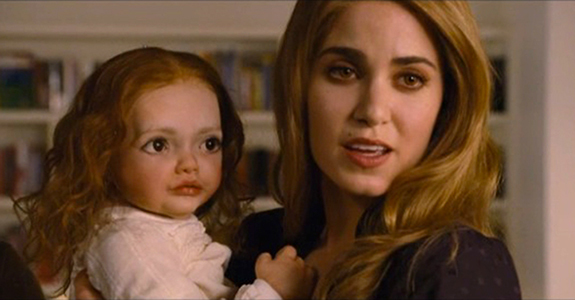 Meet Twilight’s Chuckesmee … creepiest doll ever!